nice car! 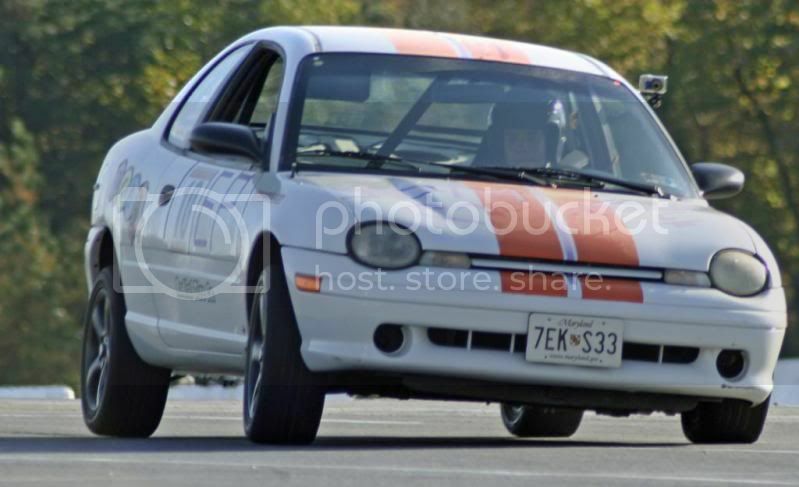 we gotta meet up and autox one day. damn you got the front tire tucking that is EPIC! i might be hitting up one of the philly region races for old time's sake. I'm being very selective due to low $$$ and i got HYPERDRIVE COMING UP!!! SO EXCITED!! a good cheap way to get tires is not to buy them new. Used ones will do you just fine, especially when you find them cheap. If you can, save the money for like 15" wheels, and then search ebay toward fall/winter. The Spec miata guys will sell 225/50/15 Hoosier R6's (4 of them) with like 6 races on them for like $50. They may be used, but it will last the average autox (especially if your starting to get serious) a while. when you feel they are done, you can always ask other racers if they have used ones. I got offered 4 275/35/17s that were used once at Solo nationals the previous year, for $120 no joke. are you going to build a full on Street prepared car? i would highly recomend getting a daily. drove an EP (E-prepared) car down to the event, raced, and back again. stripped, one race seat, roll bar, and straight through exhaust. fun for like 15mins, and on the course, annoying for the rest. Azenis RT-615 and the Advan A048's for about 70 a tire. which is extremely cheap. Can your friend get Bridgestones or Kumho's? They both have 2 top of the line extreme performance tires that are amazing on the course. Bridgestone RE-11s i've personally tried this season on my friend's prepped Street touring car, and they are AWSOME! The Kumho's are pretty much the "budget version" of the Bridgestones. Dont get me wrong, Azenis are good, but there's better out there for little to no extra $$$. The yokohama's are yet to be determained how good they are since they arn't out yet, but they are getting really good reviews. tires are a big choice!!! i hope i've given you a little help in your decision. But any tire you get, you make sure it's the right decision for your own reasons, not because someone else says its good. if i where more serious i would devote more money into it and get hoosiers but im not there yet. i am comparing and contrasting all options so i can come to a reasonable and affordable option. ordered some toys for her and they are en route to my house via big brown trucks. I also have another deal that i am working on for a few very special items. items that i had only dreamed of having. they are in. but im not sure if i want to post pics yet. dude your such a tease....just show us what you got already!! Lightweight wheels with ok tires. Slightly Heavy wheels (not as bad as steelies) and real sticky tires? why are this tires so damn expensive. do they even last. i may want to do this in the future. but right now money is an issue... pluess i will need another car.. I Found this set on craigs list for $150 when I was looking for wheels, there in Georgia too. lightwweight wheels with ok tires, because tires get replace more often than wheels, once you have decent wheels you can save for the next set of tires to have the perfect combo, but on the other hand heavy wheels will always be heavy and will need to be upgraded to lightweight later regardless of how good tires you have. you'll pick up a 0.0001s in accelaration and reduce braking distance with lighter wheels too. yeah. im still looking at hoosiers. everyone says they are the best of the best. your right stevenson, you go through tires more than wheels. i hope its sticky tires and heavy wheels. best option IMO. spend money on tires. light wheels dont win, tires do. Let me refrase my statement to further clarify my point: "I hope it's sticky tires and *cheap/inexpensive* wheels. best option IMO. Spend money on *used slicks and/or extremem performance street* tires. *Light weight/expensive* wheels dont win, tires do." As for him not being able to use the tires to there full potential, i can understand where your coming from, but when your using a set of new race tires (or used ones for that matter) you souly using them in autox or on the race track. They will wear, but not in one season. People who race at a higher level may be selling there tires when they still have life left in them, but they also need the optimal grip, which is earlier in the tire life. In autox, The Hoosier A6 can last for 3+ seasons, and even longer if you are starting out, and even LONGER if you have a car that is less than 200 hp. I know people who race in stock class (only struts and race tires allowed) who use those tires to their full potential, as in, buy new almost 4 years ago. Finally, I think extreme performane tires are good for biginning, even when you are allowed to use race slicks. Put them on another set of wheels, and use them only to drive down, race, and drive back, and you got a looonngg life expentancy.